When freshly baked, these cakes have a very soft crumb, a vibrant lemon flavor, and a cakey texture. I froze several loaves (they freeze beautifully) and upon defrosting, the texture was a bit more like a poundcake or loaf bread. They're absolutely delicious as an indulgent breakfast, or with ice cream for dessert. This recipe makes two large loaves, but I opted to make one large loaf and three small ones. The minis are a perfect size for snacking, and they'd make an adorable hostess or holiday gift. I actually defrosed a loaf this week for a quickie dessert. I was making pizzas on the grill (fabulous, by the way, it's one of my favorite summer rituals) and I threw some fresh nectarines on the grill along with the pizzas. 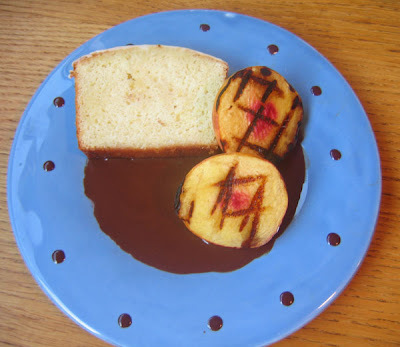 I served the warm nectarines with a slice of lemon cake and a generous helping of leftover chocolate sauce from August's eclairs experiment. 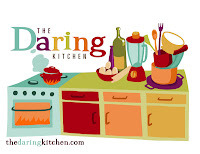 It sounds busy, but it was really phenomenal: the rich chocolate, the fragrant, tart cake, the juicy nectarines--three complex elements merged into one simple dessert. Perfection. Bake for 40-50 minutes, or until a toothpick comes out clean when checking. Do not overbake. When the tea cakes are done remove them from the oven and let them cool for about 15 minutes before inverting them. Poke holes in the bottom of the tea cakes with a thin skewer, then ladle the syrup over the holes to soak in a little. 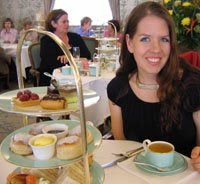 Turn the tea cakes over and ladle the remaining syrup over the tops of the tea cakes. Let cool completely before frosting them. While the tea cakes are cooling make the frosting. 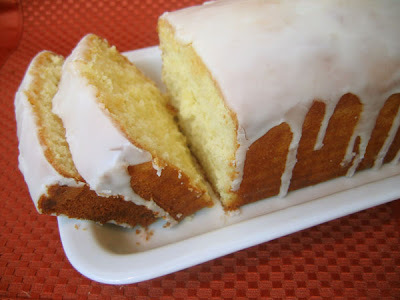 Whisk together the powdered sugar and lemon juice to make a smooth but slightly loose frosting. 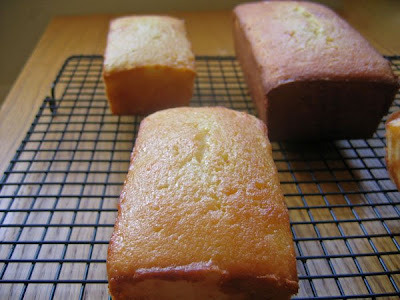 Pour over the cooled cakes and let sit at room temperature for the frosting to crust over. 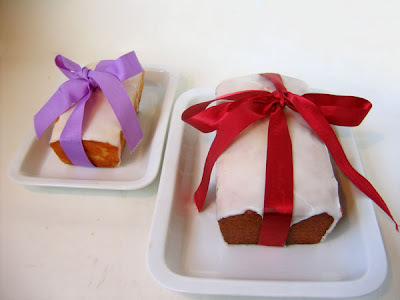 Cakes can be frozen or refrigerated, simply wrap them tightly in several layers of cling wrap. Your tea cakes look delicious! I love anything lemony! This cake looks absolutely jummy!! That should be lemon heaven allright! It's beautiful with the glaze dripping, perfect to feed the citrus love in all of us! This looks delicious! I love the glaze. 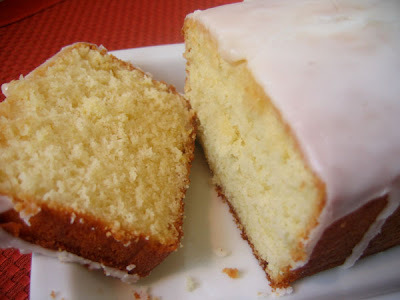 I just made a lemon cake too! I loved it! Yours look delicious! 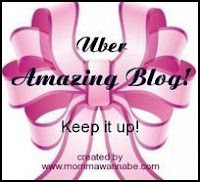 I love the ribbon! SO cute! My mouth is watering! 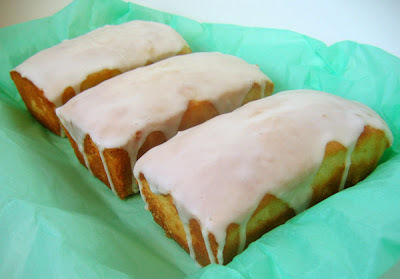 I can just imagine a wonderfully moist cake with the glaze...oh, melt in my mouth!! I'm book marking this and will definitely be making it!!! Slurp.. Delicious!! Just can't take my eyes off it!! Whoa, those cakes are lemony perfection! I'm with you about citrus dessert and yours are particularly gorgeous. I love the shots with the bright colored bows. Love the finished product. Seems like a really lemony cake. << stating the obvious. i love all kinds of cakes but my problem is that i have no patience to read anything about neither cooking nor before eating. i either want to start cooking right away or eat right away. for that reason i have never followed a recipe in my life. the situation sounds seriously bad as i wrote now...something should be done about this. thanks for the photos!